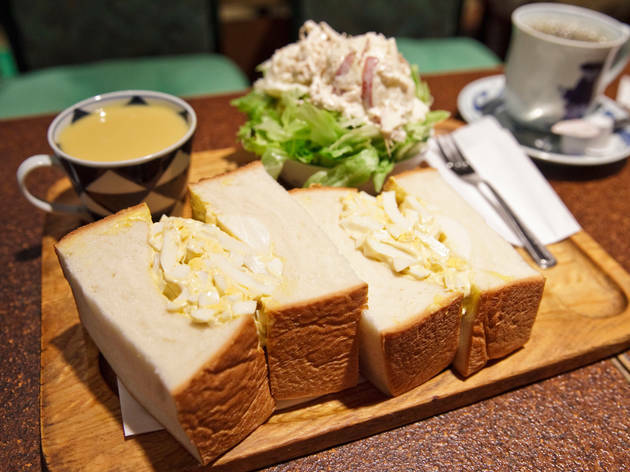 This popular café offers voluminous sandwiches on the backstreets of Ginza. The highlight of these goodies is certainly the abundant quantity of fillings competing with the massive slices of bread they lay between, resembling whole loaves more than slices. Set meals also come with heaping servings of salad and soup, and a drink, all for ¥1,200. American has more than ten choices of sandwiches, but we recommend starting out with the one filled with egg. The ingredients may be simple – roughly chopped boiled eggs and mayonnaise – but they produce a taste that's relentlessly refreshing. Take-out is also available.